Examining the theory, history, collapse, and transition of the Soviet Union. 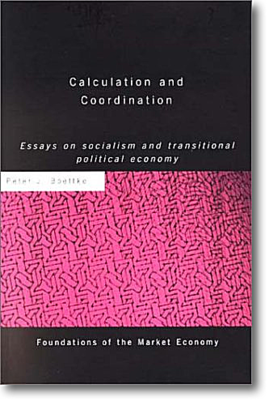 [M]y original studies in economics were in the economics history of the founding of the “Soviet Union: The Political Economy of Soviet Socialism,” and this was followed up by “Why Perestroika Failed.” A collection of my studies was later published as “Calculation and Coordination.” In my work on the failure of the Soviet system, I blend the economic calculation argument of Mises with the dispersed knowledge argument of Hayek and the logic of political decision-making from Buchanan and Gordon Tullock to explain the perverse consequences of socialism in practice. — Gertrude e. Schroeder (University of Virginia) in "The Cato Journal"
— Aaron Wildavsky (University of California, Berkeley) in "The Freeman"
— Martin Malia (University of California, Berkeley) in "The Soviet Tragedy"
— Andrzej Walicki (University of Notre Dame) in "Marxism and the Leap to the Kingdom of Freedom"
— Roy Childs in "Laissez Faire Books"
— Robert Conquest (Hoover Institution) in "The Times Literary Supplement"
— Alec Nove (University of Glasgow) in "Review of Political Economy"
— Slavo Radosevic﻿ (University of Sussex) in "Europe-Asia Studies"
— Ben Slay (Bates College) in "Slavic Review"
— Paul R. Gregory (University of Houston﻿﻿) in "The Review of Austrian Economics"
“Lessons on Economics and Political Economy from the Soviet Tragedy,” Journal of Global Initiatives, 2017, vol. 12, no. 1, pp. 23-47. “Entry and Entrepreneurship: The Case of Post-Communist Russia,” (with Bridget Butkevich), Journal des Economistes et des Etudes Humaines, 2001, vol. 11, no.1, pp. 91-114. “The Russian Crisis: Perils and Prospects for Post-Soviet Transition,” American Journal of Economics & Sociology, 1999, vol. 58, no. 3, pp. 371-384. “Promises Made and Promises Broken in the Russian Transition,” Constitutional Political Economy, 1998, vol. 9, no. 2, pp. 127-136. "Soviet Venality: A Rent-Seeking Model of the Communist State," (with Gary Anderson) Public Choice, 1997, vol. 93, nos. 1-2, pp. 37-53. "Credibility, the Monetary Regime, and Economic Reform in the Soviet Union," Cato Journal, 1993, Vol. 12, No. 3, pp. 577-584. 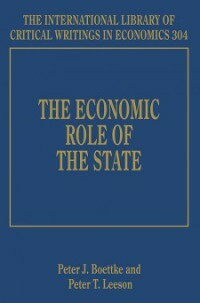 Reprinted in James Dorn and Roustem Noureev, eds., Monetary Reform in the PostCommunist Countries, Moscow: Catallaxy Press, 1995, pp. 64-72. [In Russian]. "Perestroika and Public Choice: The Economics of Autocratic Succession in a Rent-Seeking Society," (with Gary Anderson), Public Choice, 1993, vol. 75, no. 2, pp. 101-118. “The Political Economy of Utopia: Communism in Soviet Russia, 1918-1921,” Journal des Economistes et des Etudes Humaines, 1990, vol. 1, no. 2, pp. 91-138. 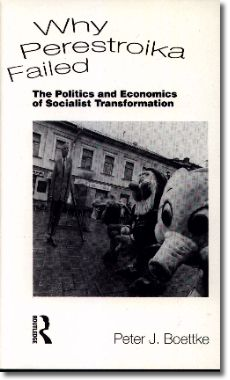 “The Political and Economic Challenges of Perestroika,” Market Process, 1990, vol. 8, pp.19-35. "The Soviet Experiment with Pure Communism," Critical Review, 1988, vol. 2, no. 4, pp. 149-182. On this episode of the Hayek Program Podcast, Hayek Program Senior Fellow Virgil Storr talks with Hayek Program Director Peter Boettke on the history and significance of the Bolshevik Revolution for the 100 year anniversary. On this episode of Free to Exchange, Ben Powell speaks with Dr. Peter Boettke about the economic systems of the former Soviet Union and Easter Block countries. 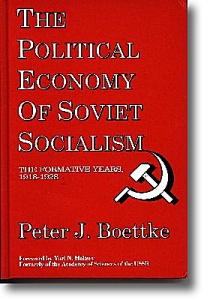 Dr. Peter Boettke (George Mason University and a board member at FEE) discusses what we have learned from the collapse of communism and the transition away from that system. Filmed at the 2011 FEE Advanced Austrian Economics seminar in Irvington, NY.